Donald Trump repeats his threat to scrap the North American Free Trade Agreement, but Canada holds firm over US demands for concessions. 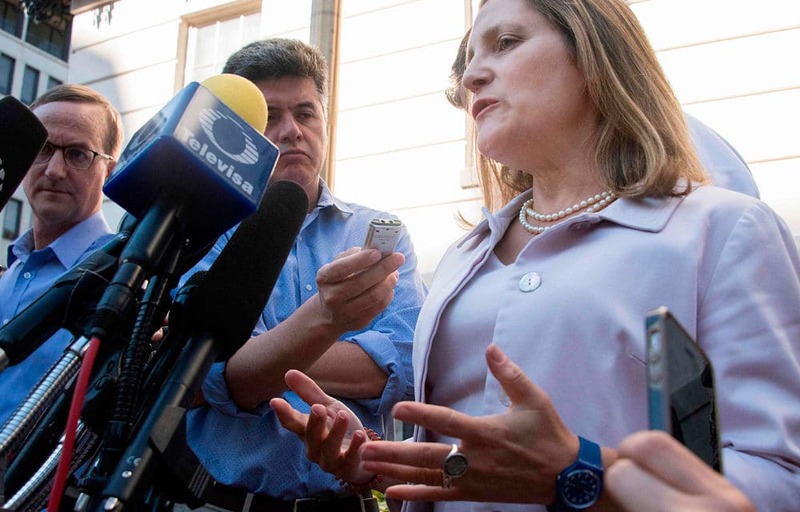 After four days of marathon negotiations between Canadian and American officials in Washington, there was no accord on NAFTA revisions, following Trump’s announcement of a “US-Mexico Trade Agreement” on Monday. The Trump Administration had set a deadline of Friday for agreement, allowing for 90 days for US Congressional passage before Mexican President Enrique Peña Nieto leaves office in December. See Trump’s NAFTA Power Play — Will It Work? But the discussions between Canadian Foreign Minister Chrystia Freeland and US Trade Representative Robert Lighthizer foundered over key points: Canada’s support for dairy farmers; the American demand for rescission of NAFTA’s “Chapter 19″, a step which would make it easier for the US to impose stringent tariffs on goods on Canadian softwood lumber; and protection of intellectual property such as movies, books, broadcasting, and other media. Trump has repeatedly threatened tariffs on Canadian automobiles if Ottawa did not concede. The Administration did not follow through on Friday, but repeated the prospect of a bilateral accord without Canada. “Today the President notified the Congress of his intent to sign a trade agreement with Mexico — and Canada, if it is willing — 90 days from now,” Lighthizer said. The White House refrained from immediate punishment because of the insistence of legislators, including Republicans, and American manufacturers and retailers that Canada must be included in any revised deal. Canada is the primary export destination for 36 American states. The Washington talks were hindered on Friday by revelations that Trump had threatened Canada in off-the-record comments to Bloomberg News, saying he had no plans to make and concessions and that any agreement would be “totally on our terms”. Trump continued to jab at Canada throughout the jab, saying it is taking advantage of the US and threatening it with the auto tariffs. My negotiating counterparty is Ambassador Lighthizer, and as I said he has brought good faith and good will to the table. It is going to take flexibility on all sides to get to a deal in the end. This idea that Canada is somehow going to get bullied into a bad deal, I can suggest to you that that’s not going to happen. I think if he was serious about a trade deal, he wouldn’t make those types of comments, because all they do is inflame the situation, and frankly it’s foolish. The Trump Administration has ended US support of the United Nations relief agency for Palestinian refugees. The State Department announced Friday that the UN Relief and Works Agency is an “irredeemably flawed operation”, while blaming other countries for not assisting Palestinians. The State Department insisted that the US remained “very mindful of and deeply concerned regarding the impact upon innocent Palestinians, especially school children”. The Trump Administration, tilting towards the Israeli Government of Prime Minister Benjamin Netanyahu, had already frozen much of this year’s US contribution. The US had contributed about one-third of the $1.1 billion budget in 2017. The Administration wants to reduce the number of Palestinians officially recognized as refugees from more than 5 million who are counted to a few hundred thousand. The Administration is pursuing a general reduction of billions of dollars in foreign aid, refocusing attention on those countries and organizations that match “US policy priorities”.